Today was the final couple of classes for the year for me. It's been such an amazing journey and it was lovely to finish on a positive note with some arrangements that I was quite happy with. This lesson was about focussing on dried, coloured or bleached materials. I used the dried leaves of the giant fig that had been so generously provided by Kevin Wallpole a few weeks prior. I had allowed the leaves to dry naturally and then I had spray painted them in a few different colours so as to best bring out their texture and surface qualities. 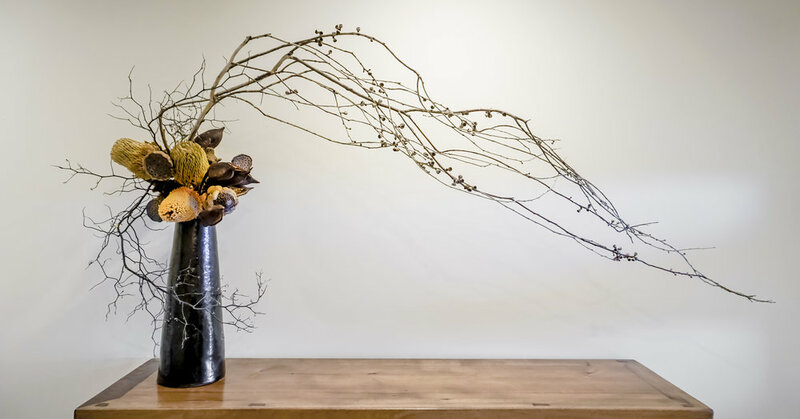 I combined the leaves with some smoke bush and a tiny bit of sea holly which complimented the main focus of the arrangement very nicely without overwhelming or competing for attention. I chose a container that had a very controlled and almost technological feel to it as a contrast to the wild and wonderfully chaotic nature of my dry materials... I was so pleased with the outcome. Bold, dramatic and dynamic! The second lesson for the day was about creating an arrangement that would be suitable to be viewed from above. Interestingly this most often means that it will also be viewed in 360 degrees and so needs to look pleasing from all sides. I was so fortunate to have a friend provide me with some artichoke in full bloom and in bud. In ikebana terms, this was a treasure and so I just had to make use of it in this arrangement. Combined simply with some sea holly and some flax I was very happy with the result. The final lesson for the day was about creating arrangements that would be suitable to be viewed from below. They might possibly be positioned on a high shelf, a ledge or the top of a cupboard or in some other similar location. Quite a tricky exercise to do I managed to make two quite nice arrangements. Unfortunately I had a bit of a headache by this stage as it was a VERY hot day and so I don't feel these are my very best work, although they definitely meet the criteria for the lesson, and my teacher quite liked what I had done. These final two photographs have quite a bit of photo editing as the lighting and position options in the studio were a bit tricky to manage but I believe I have been able to show the essence of each of the arrangements. In the end my teacher and I both felt it was a very successful and pleasant day of classes, we wished each other a happy holiday season and farewell until the new year. It's been a little while since my last blog post but there have been a few things bubbling away that I was waiting to share with you. One of these is that HanaKuma Ikebana is now providing Ikebana arrangments to Raku Dining in Canberra's cerntral business district of Civic. Raku is a top class Japanese restaurant serving some of the most excellent traditional favourites and modern interpretations of the finest Japanese cuisine in a stunningly decorated environment where you can enjoy your meal whilst watching the master chefs at work! You can now also enjoy taking in a view of some of my own lovely arrangements as you enjoy your meal. I must say I pass my most heartfelt thanks to Raku for this wonderful opportunity to show my work in such a wonderful environment. See below for a visual treat to go with your culinary feast! If you'd like to check out what delicious foods that Raku Dining has on offer or you'd like to make a booking please click on the link below to visit their page. Most recently I was very fortunate to attend a weekend seminar and accompanying workshop in Sydney given by esteemed visiting Sogetsu Master Ms Misei Ishikawa. This was such a pleasure to attend and I feel that I learned a great deal from the experience. The intention of the seminar was to properly introduce Sogetsu Ikebana practitioners to the new Book 5 Textbook. It will soon be the case that if a teacher has not attended this or a similar workshop, their teaching will not be recognised officially by the school headquarters in Japan. So naturally it was very important to attend! The aim was to unify some specific skills among teachers to ensure that they could give their students the best possible learning experience in the future. On the first morning there was a video lecture from the Iemoto of the school Ms Akane Teshigahara which was very inspirational as well as talks from Master Ishikawa about every lesson in the entire Book 5 Textbook. To say it was thorough is an understatement! In the afternoon session there was another video lecture from the Iemoto followed by practical demonstrations by the master which was again very inspiring! An informal dinner at a local restaurant followed. The next day was a day of workshops where we were able to show off our own practical skills for the Master and receive some valuable feedback. In part one we were asked to assemble a free standing structure from some provided branch material. We could assemble using wire, nails, screws etc but the fixings that we used had to not be obviously visible. A fun challenge to be sure but one that I was able to meet. 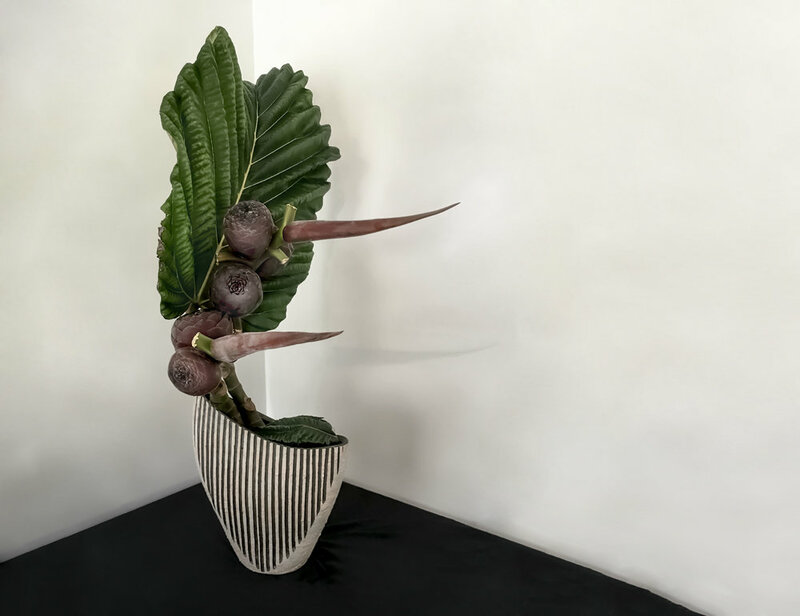 Part Two required us to add a container and turn the branches in to a different position than was initially used and to then create a completed arrangment adding foliage and plant material. The results around the room were so massively varied it was a wonderful demonstration of the different things that could be done using these few techniques. Here is a photograph of what I was able to achieve. Master Ishikawa paid me a great compliment in saying the arrangement captured the spirit of "Ikebana becomes me" which is a fundamental ideal of the school in terms of Sogetsu Ikebana reflecting the very nature of the artist that makes it, and that it was "very impressive" meaning that the arrangement showed a lot of my own self in its boldness and strength. In the afternoon session we were asked to create a celebratory arrangement using as much of the same material as we liked but also having a mandatory components of some camelia leaves and the addition of mizuhikki (Japanese paper string). I decided that I would celebrate something close to my heart and commemorate the results of the recent plebicite on marriage equality which had resulted in the national population voting yes to marriage equality for LGBTIQ+ people. For me there was so much meaning in the arrangement. The heavy branch representing a great obstacle being overcome, the lower swirls of mizuhikki representing the seemingly endless cycles of debate on the issue, the red bougainvillea for the passion of the people and the cost to many of that struggle for equality and finally rising above, the camelia leaves as a symbol of victory, new growth and renewal, also incorporating mizuhikki loosely representing two samurai interlinked. As I explained my thinking and the symbolism the room went quiet and at the end I received a round of applause... I think everyone was very moved and this will be a memory I will treasure for the rest of my life. While Master Ishikawa was a little uncertain around the subject matter of the arrangement as I talked about the meaning her appreciation grew and grew and I could tell she appreciated the thoughtfullness that had gone into what I had done. Not only was it aesthetically pleasing but very very meaningful. In the end she was very approving of the arrangement. That wraps up the seminars and workshops part, classes will be covered in part 2!